With the new year comes new plans, new resolutions and . . . elections. For many community associations election season is well under way and, as easy as an election may seem (go out, get the votes, and count the ballots – right? ), there are so many statutory nuances in the electoral process that, if handled improperly, can invalidate the entire election and cost the association both time and money. In an effort to assist association boards and hopefully avoid costly mistakes during the process, we have outlined the pertinent information that you need to know. The first notice must be mailed, emailed, or hand delivered to the membership at least 60 days prior to the annual meeting/election day. The date, time and location of the meeting and election. The number of seats that are open for election. Details surrounding the information sheet that candidates must submit if they wish to run for the board. All eligible persons who wish to run for the board must submit their notice of intent to be a candidate for election no less than 40 days prior to the annual meeting/election. Notice of intent may be submitted via mail, email, or hand delivered statement. Any notices of intent received on the 39th day before the election (regardless of the day of the week that the 40th day falls on) – are deemed invalid and those names may not be placed on the ballot. Each eligible candidate then has an additional 5 days (35 days prior to the election) to submit an information sheet (resume) to the association which will be mailed out with the second meeting notice. The second notice of election must be mailed, emailed or hand delivered to the membership at least 14 days prior to the annual meeting/election. Instructions for casting a ballot. The notice and agenda for the annual meeting (which will include the election). Any information sheets (resumes) submitted by eligible candidates. The ballot listing all of the eligible candidates’ names in alphabetical order. An inner envelope labeled “Ballot Only” and an outer envelope labeled with the address of the property manager or the association. In order to be valid, the unit owner’s name must be printed on the outer envelope, together with the unit number, and the eligible voter’s signature. The eligible voter must select a candidate using the ballot included with the second notice and place it in the inner envelope. The inner envelope must then be placed in the outer envelope. The outer envelope may then be mailed or hand delivered to association or property manager. The same process must be utilized (ballot, inner envelope and outer envelope) at the annual meeting up until the time that the inspectors of the election begin to open the outer envelopes. While this process may seem tedious and time consuming, it is extremely important to remember that the process is in place to ensure a fair election. 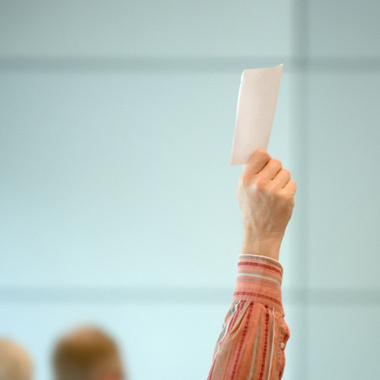 When casting your vote, keep in mind the importance of the board in your community. The board generally serves as the “people’s voice” and handles the day-to-day operations and decisions of the association and, in conjunction with the manager, ensures that the community runs smoothly. Annual meetings and elections are an extremely critical time for any community association, so it is important that they are treated as such. Please be advised that you may contact your attorney to handle the election for your association, as they are able to monitor and assist with the process to ensure all steps are followed correctly.